Here you can find a range of authentic paella pans which we have selected for you. 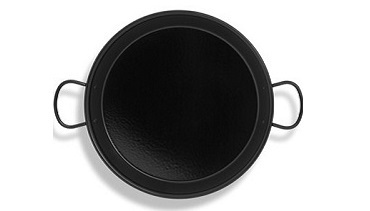 Each style of paella pan has its advantages; From the traditional Carbon Steel paella pan or the easy care Enamelled Paella pan, to the specially made paella pans for Induction with the flat base; We also have the special thickness paella pan which is thicker and sturdier and indicated for restaurant kitchen; and the top of the range stainless steel paella pan, a great choice for people who like to keep their pans on display. All the paella pans can be used on a gas or charcoal grill or on our paella burners and all paellas are made in Valencia, Spain. See the "Care Instruction" tab. Paella Pans There are 85 products.